SpaceWatchtower: Moon Day - A National Holiday ? Moon Day - A National Holiday ? Forty-four years ago, man first landed and walked on another planetary body, the Earth's Moon. On Sunday Afternoon, 1969 July 20, at precisely 4:17:40 p.m. Eastern Daylight Saving Time (20:17:40 Coordinated Universal Time) the Lunar Excursion Module (LEM) named Eagle, with astronauts Neil Armstrong and Buzz Aldrin aboard, landed in the Moon's Sea of Tranquility, at a site from then on called Tranquility Base. Neil Armstrong became the first human to set foot on the Moon that evening at precisely 10:56:20 p.m. Eastern Daylight Saving Time. Originally, the first steps on the Moon had been planned for the early morning hours of Monday/Moonday. However, the earlier time allowed millions of Americans to view the event, on live television, at the tail-end of Sunday evening's television prime-time viewing period. 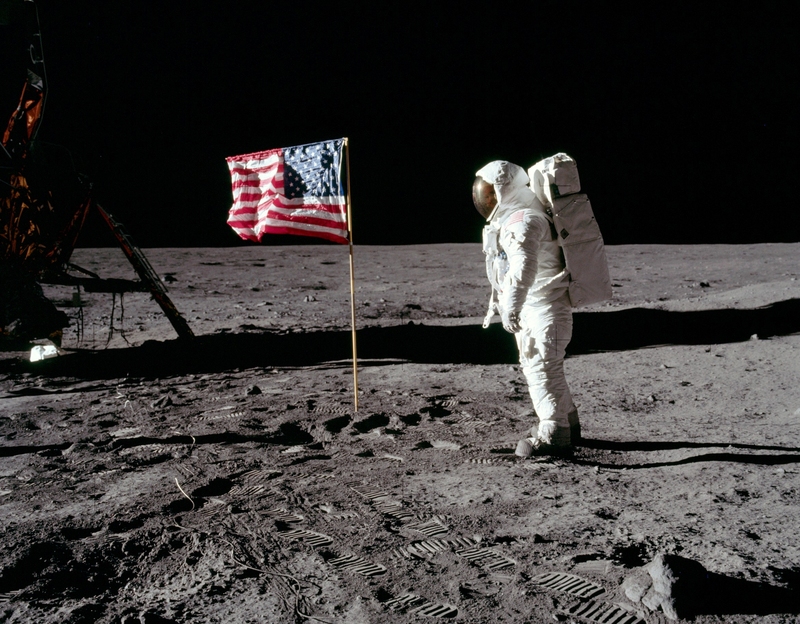 By the time scale most scientists use, Coordinated Universal Time (UTC), these first steps did occur on Monday/Moonday, 1969 July 21 at precisely 2:56:20. Should Moon Day, July 20, be designated an official national holiday ? James J. Mullaney thinks so. Mr. Mullaney, former Curator of Exhibits and Astronomy at Pittsburgh's original Buhl Planetarium and Institute of Popular Science and Staff Astronomer at the Allegheny Observatory, says: "If there's a Columbus Day on the calendar, there certainly should be a Moon Day!" Mr. Mullaney has been campaigning for July 20 to be officially designated as the Moon Day national holiday for several years. J. Kelly Beatty, Senior Contributing Editor of Sky and Telescope Magazine, supports this campaign, as does Steven L.J. Russo, Director of the East Kentucky Science Center and Planetarium. In 2003, the International Space Station Fan Club started a petition to designate July 20 as National Space Day. And, on 1999 July 20, the nation of Morocco, at a United Nations conference, proposed that July 20 be designated as International Space Day. The last day to be designated as a federal holiday was Martin Luther King, Jr. Day, which is celebrated as one of the nation's Monday holidays near the civil rights activist's January 15 birthday (celebrated on the third Monday in January). It took many years to build-up support for such a federal holiday, with the first designation attempt in Congress not coming until 1979, eleven years after Dr. King was assassinated. Due to some political opposition, the holiday designation did not occur until 1983 November 2, when President Ronald Reagan signed the designation bill into law. The first Martin Luther King, Jr. Day was celebrated 1986 January 20. This celebration occurred eight days before a major tragedy in space history: the explosion of the Space Shuttle Challenger, shortly after launching from Cape Canaveral with the first teacher-in-space, Christa McAuliffe, aboard. Thus far, support for a Moon Day national holiday seems to be limited to outer space enthusiasts. As Mr. Mullaney notes, if the discovery of the "New World" in 1492 is important enough for a federal holiday, it would reason that man's first step on another world would certainly justify such a designation. So, such a designation, or similar commemoration, will probably occur some day. But, politics being what it is, it would be very difficult to predict when such a day may arrive. I would prefer "Moon Landing Day"
What are the Canadian holidays for 2018?